Naegleria fowleri is an uncommon cause of severe meningoencephalitis. The trophozoites range in size from 7-20 µm. They have a single nucleus with a large karyosome and no peripheral chromatin. 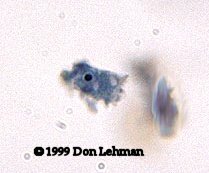 The cysts have a single nucleus that is almost identical to that seen in the trophozoite. N. fowleri morpholocially resembles the Acanthamoeba spp.